During our climb of Lobo's Nagpatong and Bangkalan, we noticed an unexplored mountain close to a locals house. We told ourselves that we can go back here one of this days to fully explored the place and introduce it to the community. The name of the peak is Salakot, and one of the prominent peaks along the Lobo mountain ranges. So yesterday, we came back to have the placed explored. Apparently one group went ahead of us according to the guides, but never got to fully document the peak. After hiking for almost 3 hours, the actual trail at the base of salakot peak (or non existence of) begins in an open area full of Taro plants before the full cover of dense forest. The ground consist of twigs, loose rocks, and muddy trail. After almost an hour of hiking, the summit with 360 view of the entire area is visible. Though very small, the summit is the best in all the peaks I have reach in this area. According to my pro-trek the summit measures 630masl. And for everyone's information, this peak is different from the Mt. Salakot being connected to the Lalayag monolith gaining popularity this days. Another question is can this be included in the Nagpatong and Bangkalan peak hike? Yes it can be done just add around 2 hours to your budget time. Just take note that there is no campsite at the summit. For those who wants an IT of the climb, just send me an email located in my "about the author" entry. 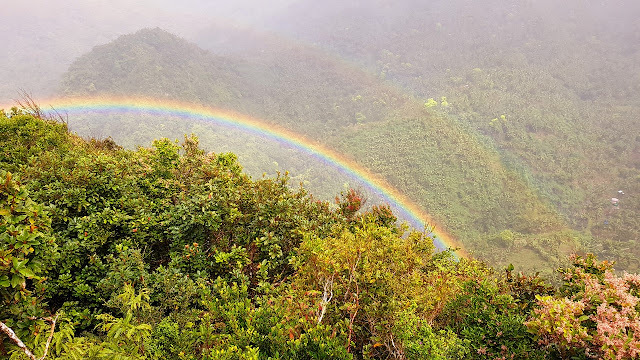 We luckily saw a double rainbow in the summit.